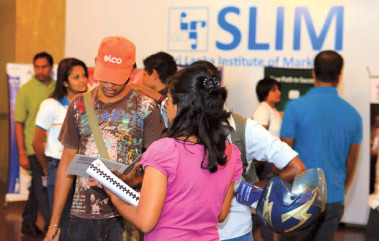 The Sri Lanka Institute of Marketing (SLIM) recently took part in EDEX Expo 2014, strengthening a continuing partnership between the national body of Marketing and the premier higher education and career exhibition in Sri Lanka. In Colombo the Exhibition and Job Fair was held from January 17-19 at the BMICH while in Kandy it was held from January 25-26 at the KCC. The attractive stalls operated by SLIM offered a comprehensive overview of the institute's educational product portfolio and was popular among over 65,000 attendees. SLIM President Gamika de Silva said, "The importance of creating awareness about the educational services and courses offered by SLIM among the youth population cannot be understated. "We consider the EDEX Expo, with its ever growing popularity and presence in Colombo and Kandy, as the ideal platform for communicating with a mass audience," he said. CEO and Executive Director, SLIM, Sanath Senanayake said, "The experience of participating in previous editions of EDEX Expo influenced our decision to support it in 2014 and it has been yet another satisfying experience." "Our stalls attracted students and professionals alike in both cities and the feedback has been encouraging," he said.